Please take some time to review the Awakening the Domestic Church website. This apostolate is being coordinated by Dcn Darrell Wentworth of the New Creation Community in Virginia Beach. Feel free to add more in the Comment Box. If you find yourself getting spiritually complacent, or if you feel overwhelmed by the many demands of daily life, then this article by Msgr Charles Pope may help you to re-focus your priorities. 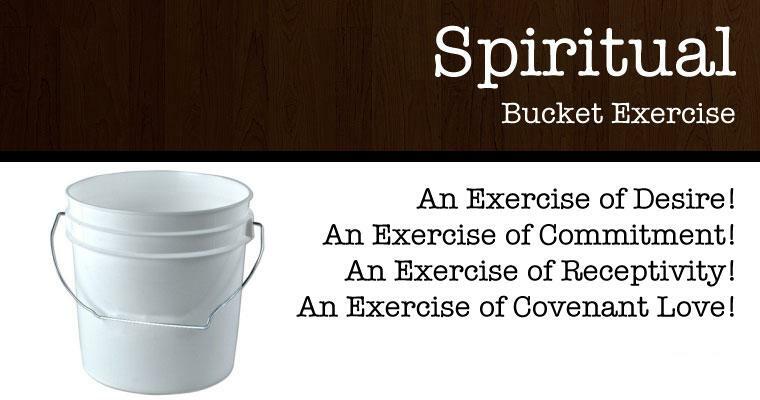 In order to help their members grow in their ability to live out their Community’s founding charism (“Receptivity and Commitment to the Person and Culture of the Holy Spirit, particularly in Covenant Love”), The City of the Lord Community is promoting a unique and intriguing program: The Bucket [Spiritual] Exercise Workout Program. Read the details here. Devotion in a married woman is most praiseworthy, but she must never forget that she is a housewife. Sometimes she must leave God at the altar, to serve Him in her housekeeping. 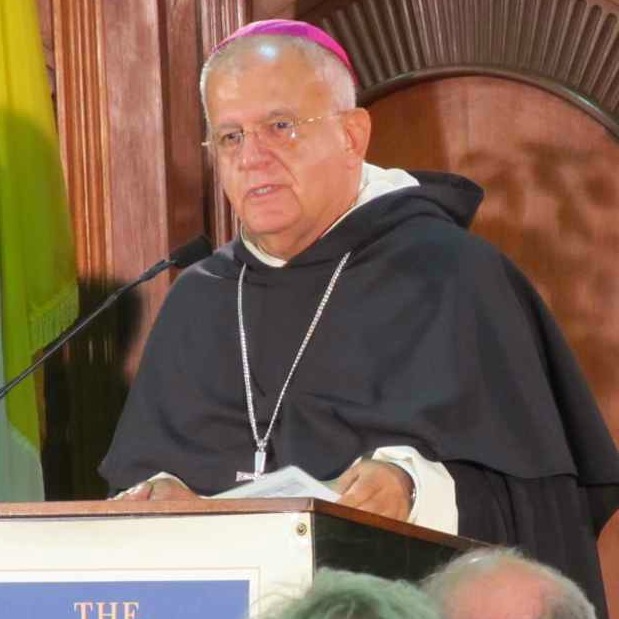 A few months ago, on the Roman Catholic Spiritual Direction website blog, Fr John Bartunek LC responded to an inquiry concerning married women growing in spirituality/holiness. His response, along with many of the Comments from readers (which can be found at the end of the article), offered quite a few suggestions. Perhaps this topic might interest some women in our Community, or provide them with resources to suggest to their daughters or daughters-in-law. This week in his daily radio program, Peter Herbeck began a series in which he will review St Ignatius of Loyola’s rules for the discernment of spirits. St Ignatius has 14 such rules, and Peter plans to cover all of them. You can find the programs in his audio archives. You’ll find a link to Fr Bartunek’s retreat guides on our right sidebar. I highly recommend them. They provide the resources for you to make a little retreat at home, or to use occasionally for inspiration. The topic for Retreat Guide #7 is the Sacred Heart of Jesus. Last Tuesday evening (March 27) was the sixth and FINAL session sponsored by our Community during which we previewed ChristLife’s “Discovering Christ” program. After some prayer and praise, the group viewed the eighth video entitled “New Life in the Spirit: Being a Catholic Disciple,” by David Nodar, and then the ninth and final video entitled “Community and the Sacraments: Why We Need the Church,” by Father Erik Arnold. After the videos, the group discussed the presentations. There were still comments in favor of LIVE presentations, and something else was needed to “Mix-up” (i.e., add variety to) the constant DVD presentation. To balance this, the point was also made that we are NOT seeing the true effectiveness of the program because we do not know what happened in the share groups. While there was some concern over the lack of reference to the parish for community, it was believed the participants in these particular videos were probably students who would not find community at a local parish, but at home. This point helped us all realize that this presentation is very important and usually “tailored” to the situation. Where there is strong opportunity to experience community in the parish, direction is given; if that encouragement needs to be directed to another group (i.e., prayer group, covenant community, etc. ), then that suggestion can also be made. Ideally, a parish would have ways to bring in those completing the seminar, but that is not always the case. Some questioned if the ChristLife approach falls short our expectations of the Life in the Spirit Seminar in the Catholic Charismatic renewal. The point was made that any concerns about the DVD vs. Live presentations should be carefully discerned. Can our own desire to give talks be in the way? Do we have too much ownership? Jim Gialanella thanked the attendees for their steady participation in the project, and had everyone complete a questionnaire on the presentations. Jim has subsequently tabulated these responses, and will report them to the CCR Life in The Spirit Committee that will meet on Wednesday, April 11. Hopefully, the committee can come to some conclusion about using the ChristLife Program in any future Life in the Spirit Seminars. Finally, many thanks to all at ChristLife for making this tool available to the Church! Yesterday evening (March 20th) was the fifth of the sessions sponsored by our Community during which we’re previewing ChristLife’s “Discovering Christ” program. After some prayer and praise, the group viewed the seventh video presentation entitled “The Holy Spirit and You,” by Father Erik Arnold. After the video, the group discussed the presentation. Many commented on the easy, positive flow of the presentation. There is a definite “gentleness” in the approach of this program. It is not a hard sell, but still gets to the heart. The reference to Church Tradition in the “laying on of hands” was very effective. Fr Arnold made reference to the “Act of Faith” involved when the participant comes forward and makes the “Prayer for Renewal.” Some in the group saw that same “Act of Faith” in the prayer teams when they depend more on the providence of God, than on the depth and duration of their own prayers. Many noted the inclusion of the 2008 Pentecost quote by Pope Benedict XVI. One person was very touched by Fr Arnold’s story of his crisis of faith. It was an emotional connection to his own experience. While there was general agreement on the approach not to get into too much depth regarding the spiritual gifts at this point, several still felt a little more preparation was necessary before the prayers for the baptism in the Holy Spirit. There was some thought expressed that talks six and seven could be combined, with a live witness. This would allow for an eight week program. Since the ChristLife materials actually state that 25 to 40% of participants do not attend the special Holy Spirit Retreat day, there was general consensus that this may not be the better context in which to offer the prayers for the baptism in the Holy Spirit. The personal experience of just about everyone in the group was that the attrition rate was usually less than 10% when done in the routine weekly schedule instead of a separate retreat. There was a suggestion to lengthen the Prayer for Renewal, making some connection to participant’s Baptism and Confirmation. There was a sense that the prayer teams really needed to be prepared in advance for this activity. They need to be familiar with the instructions and the “Act of Faith” concept for both participant and prayer team members. Jim reminded everyone that there is supposed to be a “Leaders Day Retreat” in preparation for the sessions. Discussion of how to lead small groups and the Renewal Prayer were part of this day. Several believed this has been an OVERLOOKED AREA in recent Life in the Spirit Seminars. We need to get back to that preparation. Participants should be ready review talk #8 “New Life in the Spirit: Being a Catholic Disciple,” and talk #9 “Believing & Belonging: Why We Need the Church,” after watching those videos. After some prayer, the group viewed the fifth talk in the series entitled “Why is the Resurrection Important for Us” by David Nodar, and the sixth talk entitled “Who is the Holy Spirit?” also by Dave Nodar. Some commented that they really never put all this evidence together in the way David Nodar did. These presentations really meet the younger, logical mind of today. It helps them “prove the thesis” for the evidence that supports the resurrection. The information and connections build throughout the presentations. Some expressed these two talks were done with more passion than others. The content of these talks was different in contrast to the “New Life” and “Preparing for the Gifts” talks of the more traditional Life in the Spirit Seminar. There was general agreement that the “Discovering Christ” talks were more in-depth and provocative. There is good movement toward the actual baptism in the Holy Spirit to come. The technology of viewing the scripture passages helps in emphasis and attention. Pointing out the difference between infant and adult baptism helps in the understanding of why there is a disconnect today with our faith/commitment and God’s grace when it comes to receiving the power and the gifts of the Holy Spirit. Great tie in with Old Testament signs of a new outpouring of the Spirit. The explanation of what happened at Pentecost is better seen as part of the long, unfolding plan of God as foretold by prophets of old. Comments still came forward expressing the advantage of “live” presentations over using the DVD’s. This is not a concern that is going away. Some expressed the connection felt when the presentation is by someone they know or who they have actually met through the seminar. The relationship connection helps in appreciating struggles and successes as expressed by actual live speakers. Some of the reviewers did not think the joke at the start of talk six was appropriate. Not only that, it did not seem to connect to the talk. They suggested fast-forwarding that part to the start of the teaching. There was some disagreement on the issue of emphasizing the impact of sin more. The comment was made that a more pronounced emphasis on sin and eternal death by Father Arnold in an earlier talk would have made talks 5 and 6 even more powerful. There was a response that to do this may give the wrong message. It may tend to over emphasize the fear of Hell as opposed to the love and mercy of God. Participants should be ready to move into actual “small groups” as we review the baptism in the Holy Spirit dynamics of the program. Jim Gialanella, Bob Valiante and Kathy Bagley recounted some of what they remembered from the February ChristLife Conference in Maryland. There does seem to be a caution against over-extending the prayer time and including elements of distraction from the participant’s genuine time of surrender and petition. Hopefully next week’s session will be just as rewarding. Invite someone! Yesterday evening was the third of the sessions sponsored by our Community during which we’re previewing ChristLife’s “Discovering Christ” program. Again, about 35 joy-filled Catholics involved in various apostolates (CCR, parishes, youth ministry, men’s movement, etc) responded to our invitation. Walt Babetski lead the discussion after a time of quasi-Liturgy-of-the-Hours Evening Prayer. 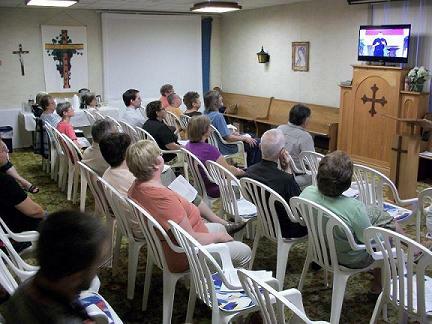 The group viewed the third DVD entitled “What Does Jesus Want Us to Know,” by David Nodar, and the fourth DVD entitled “Why Do I Need a Savior” by Father Erik Arnold. There was also a very brief 10-minute DVD called “Lump” that was part of the third talk. It was viewed immediately at the end of talk three. Following the DVD presentations, the group discussed the videos. Now, after four DVD’s, it has become very evident that the speakers do an excellent job each time in recapping the previous talk and immediately connecting it to the new presentation. The talks are very clear and the information is presented in a well organized, understandable way. Some of the vernacular used in talk three especially connects well with young people. The LUMP DVD was, by far, the most impacting. It was likened to a “modern day parable” in how it was presented. It was a very EMOTIONAL presentation. Many believed this could easily be a key transition point for participants and that the share group leaders need to be keenly aware of the deepening level of discussion that may take place in the groups that night. Many of the program previewers present spoke of the impact the LUMP DVD was having on them. It brought home the clear message that many who think they may be “seasoned” in their faith still have much to learn and experience about God’s love for them. Questions for share groups were reviewed and appeared well connected and provocative for discussion. Father Arnold brings home clearly the point that “Knowing” is not enough. We need to “ACT” on what we hear. We need to DECIDE! He also noted the important concept that it is an ONGOING PROCESS. The “Prayer of Commitment” was an excellent tool to bring participants closer to the surrender soon to come on the evening of the Baptism in the Holy Spirit. The camera shots of participants helped develop a sense of importance, attentiveness. While some concern still surfaced using DVD’s instead of live talks, others expressed the positive in the DVD’s, such as the consistent high level of information, clarity, and positive use of technology. Comments still came forward expressing the advantage of “live” presentations over using the DVD’s. It again came up to include more live witnesses if using the DVD’s. There was a comment to have more on SIN in Father Arnold’s talk, since so many Catholics feel that they commit personal sins very rarely. There was a comment that the talks need to be more dynamic. To continue to try and review two DVD’s next week. Doing discussion after each DVD, not waiting to see both first. To be ready to move into actual “small groups” as we review the Baptism in the Holy Spirit dynamics of the program. Yesterday evening was the second of the sessions sponsored by our Community during which we’re previewing ChristLife’s “Discovering Christ” program. Again, about 30 joy-filled Catholics involved in various apostolates (CCR, parishes, youth ministry, men’s movement, etc) responded to our invitation. W ith Walt absent due to a last-minute family emergency (just plumbing), Jim Gialanella led the discussion after a time of prayer and praise. 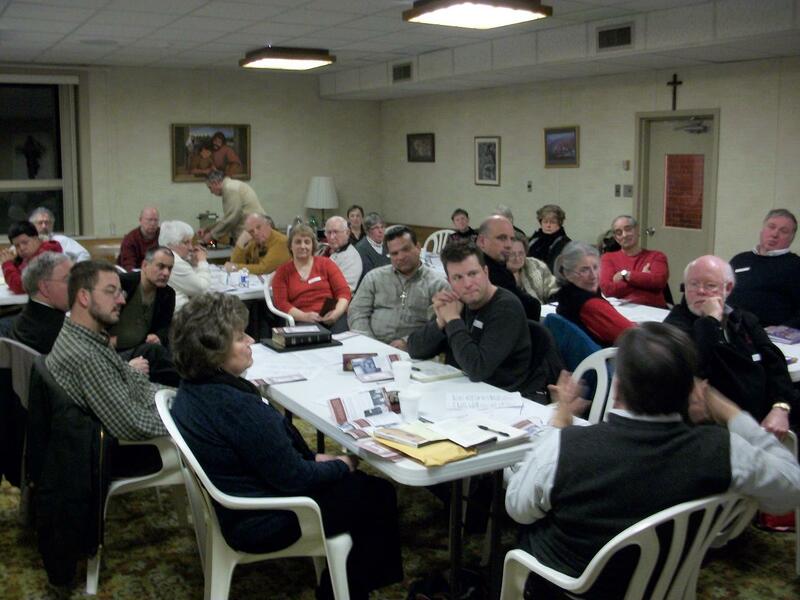 The group viewed the second DVD in the series entitled “ Why Does Jesus Matter,” by Father Erik Arnold. Following the DVD presentation, the group discussed the video. Creative use of technology/media again noted, especially with the quick “man on the street” question – “Who do you say Jesus Christ is?” This helped look at all perspectives of answers. The provocative presentation gives participants a reason to continue. While there was a question regarding the need for more background for the answer to the Question “Who Is Jesus Christ,” it was generally agreed that too much information too soon is counter productive. The presentation struck just the right balance between inquiry and information. To dwell too much on this is to begin to question the Providence of God to act unless the informational level is perfect. The necessity to have share groups arranged by gender, youth, age was seen by several as not extremely necessary. Attracting participants was again part of the discussion. Representatives of Our Lady, Queen of Peace parish talked about using Facebook and the church website. Another question arose concerning how would this new ChristLife approach be presented to a parish team. The general consensus was to consider this later after the entire program (Discover Christ) had been evaluated. Many expressed the opinion that there still needs to be a “flesh and blood” witness that can be combined to the DVD. There was a suggestion that an “assignment” after week one should be to have the participants ask at least three people the question “Who Is Jesus Christ” and have them share their responses as part of the Talk 2 share group. There was general concern expressed that the “Participant Guide” did not provide related scripture readings from week to week. The use of the familiar, most recent “Life In the Spirit Participant Guide” was suggested for use from talks three through nine. To review two DVD’s next week, with less discussion time. Everyone felt comfortable with this suggestion and believed the assessment of the talks would now move much faster. To STAY in one group for the discussions. To be overly concerned about perfect level of information provided or total dependence on publicity denies the Providence of God to work in this effort. Yesterday evening was the first of the sessions sponsored by our Community during which we’ll be previewing ChristLife’s “Discovering Christ” program. More than two dozen joy-filled Catholics involved in various apostolates (CCR, parishes, youth ministry, men’s movement, etc) responded to our invitation, so we had about 40 people, including one priest, in attendance overall. After providing a brief overview of the ChristLife apostolate and it’s Discovering Christ, Following Christ, and Sharing Christ programs, we viewed the short “invite” video, followed by the “Meaning of Life” talk by Dave Nodar, which is the first talk in the Discovering Christ program. An hour’s worth of healthy discussion ensued. What is ecclesial forgiveness? Cardinal Francis Stafford explained it in a talk he gave last October. You can read a summary and listen to his talk here. You are currently browsing the archives for the Formation category.